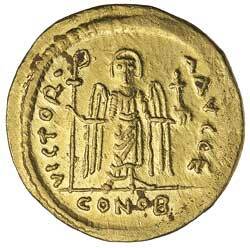 PHOCAS, (A.D. 602-610), gold solidus, Constantinople mint, (4.45 g), issued A.D. 607-610, 10th Officina, obv. 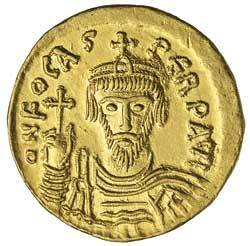 Phocas facing bust, bearded, wearing cuirass, paludamentum and crown, holding cross, around DN FOCAS PERP AVI, rev. Angel facing, holding in right hand long staff, with partial chi-rho symbol at top, in left hand globe with cross above, around VICTORIA AVGUE, (S.620, DOC 10e, MIBE 9, BMC 10-11, R.1181, Berk, Harlan J., "Roman Gold Coins of the Medieval World, 383-1453", No.102b). Brilliant field, as struck, good extremely fine.